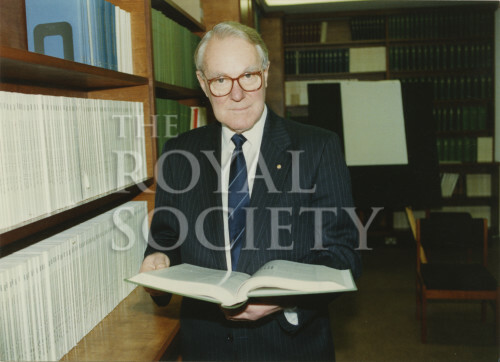 Three-quarter length portrait of John Warcup Cornforth, standing next to a bookshelf holding a book. Stamped on the reverse ‘PHOTO BY UNIVERSAL PICTORIAL PRESS & AGENCY LTD 30-34 NEW BRIDGE ST., LONDON EC4V 6BN TELEPHONE: 071-249 6730 FAX: 071-489 8982 This Copyright Photograph must not be reproduced without the written permission of this Agency. Ref. No.’ and inscribed ‘U3266-A-13’.